Keep predators out (mainly the Fox in the UK but also Badgers in some areas). Keep your chickens where you want them. The first is of course the highest priority to keep your chickens safe, I am happy to lose the odd plant if an escapee wanders onto the vegetable patch, this is soon forgotten about but discovering birds with their heads removed and bodies half buried is something you don’t forget for a long time, if at all. So what are the options when it comes to fencing chickens? One of the best solutions for me has been an electric fence but this does come at a cost and requires regular maintenance. There is more information on the different kinds of electric fences on my Electric Fence page and kits can be purchased online such as this one. The good old fashioned way is to use galvanised chicken netting or rabbit wire as it is called in the trade. This needs to be at least 6 foot high and I say this because I have seen a fox leap up and scramble over the top of a 5 foot high chicken run fence when I found him inside one of my runs one morning. Wire needs to be buried in the ground about 8 inches, ideally 12 to be completely safe but if you bend the wire out, you can normally burry it 6 inches with a 6 inch overlap. If you are on sandy soil that is easier to dig, I would consider improving the depth of your chicken fencing. Another option for securing the base further is to use boards around the base. This helps to keep any substrate inside the run (such as sand, gravel, or wood chips) but also secures the vulnerable bottom edge of the netting that is likely to get tugged and pulled at by a fox or badger and keeps the fencing rigid. If, like me, you like your chicken run to look attractive, you can of course grow things up the outside of the fencing. I have in the past used a grape vine but the same could be done with many different climbing plants. Try to tie the plant to the wire, rather than threading it through to stop it from damaging the wire when it grows and rubs during the wind. If chicken fencing is weak, foxes can and will tear at it to try to get in. If the wire isn’t taght or if there are weak points, don’t wait – fix it! If you can’t find a local supplier of poultry wire – you may be able to find something suitable here. 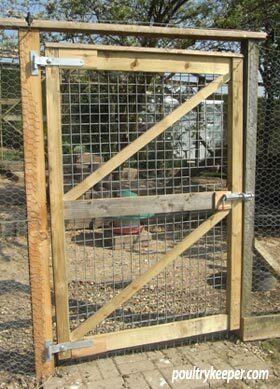 Chicken fencing can be fairly straight forward if you are around during the daytime and don’t have a fox problem and would like to keep your chickens in a designated area. Omlet sell some chicken fencing that is a handy sized poultry netting complete with poles. This is a great idea as it allows you to easily change the shape and position of the chicken run to provide fresh pasture for them. It keeps your hens where you want them but remember this isn’t fox proof or electrified so should only be used to keep chickens in a given area when there isn’t a fox problem or when you’re around. 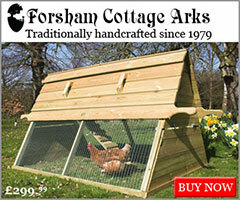 It is really good news for gardeners as you don’t want the chickens scratching up your beds or eating your new plants! If you turn this idea on its head, you can also use this netting to keep your chickens OFF your vegetables or garden by fencing the area off to stop them getting in! I’m clearing a large area in my garden currently overgrown with brambles and ivy and am wanting to get a few chickens when it’s cleared. I’ll have a large area for the coop and an outside run, and luckily we don’t have foxes or badgers on the Isle of Man. Will they be ok on fairly rough ground or is a grassed area better? Thanks. You are right, there are certainly no foxes on the Isle of Man, I have heard this mentioned many times before. Fencing isn’t really a problem for you, providing they don’t wander onto neighbours land without permission. Rough ground is fine, they will forage for insects, slugs, bugs etc but they do need greens so you would need to provide more of these if there is no grass. Do I have to worry about a fox during the day? If I shut my chickens away in their wooden coop every night, do I still have to bury the chicken wire? My chickens will be free range during the day and shut away each night. We plan on keeping 2 bantams, how can we get them used to being handled? Thanks I advance for your help! Hard to say for sure but it is a risk because foxes are very able diggers, day or night. 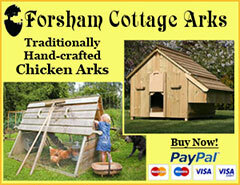 Try mealworms as treats to get the chickens used to being handled. Some tame more easily than others though. Some of the lighter Mediterranean breeds can fly well (but you could clip the feathers of one wing). The heavier breeds can’t fly more than a foot off the ground. Foxes could be more of a problem. They will scratch – so lawns, unless a reasonable size can get worn down. Yes, you can keep them in a reasonable size run but they will get bored and sick unless you give them some regular free ranging. I live in an area with a very high density of urban foxes. We regularly have foxes in the garden – not infrequently during the day. 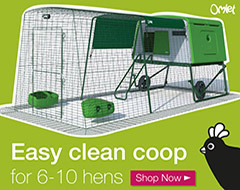 If I build a big enough enclosure ( I only want 3 chickens and we have a big garden) can I leave the chickens happily in there for the majority of the time? How big would the enclosure need to be and what gauge wire? When I am around, or the dog is in the garden (he does not bother chickens but deters foxes) they could be let out to wander around for an hour or so each day. Will I need a concrete sill under the door to the enclosure? Yes, it’s fine to keep chickens in a run if it’s big enough and you can give them regular greens. Grass usually turns to mud fairly quickly with them scratching unless the run is really big. Size is difficult to gauge but for 3 chickens 6 by 6 meters would be a good size run. Foxes can (and have) got through cheap rabbit netting (sometimes called chicken wire). If you talk to a farm supplier they will usually tell you that there are 2 types available – the cheap sort from China (say £30-£40) and the more expensive British made netting (£50-£60). The difference is the gauge of the wire and the quality of the galvanising and this is obviously important for strength where foxes are concerned. It is best to bury a length of wire then double up at the bottom by starting again with another length of wire at ground level. This overlap will give extra strength. Weave the two together with a strand of galvanised wire. Hi I am thinking about keeping chickens. I go away for 2 or 3 nights on business now and again. Once I have my run and nesting area complete, does somebody still need to physically put them into the nesting area at night, or will they go in on their own. The run will be secure and plenty feed and water provided. It depends on the breed. Larger fowl like Orpingtons and Sussex can’t usually get more than a couple of feet off the ground but Italian breeds such as the Leghorn can be quite flighty and can clear a 6ft fence. In general, I would say a. 5ft fence would be adequate. If it is not, you can clip the feathers on one wing which will unbalance them and usually stop them from flying. I normally find once the chickens settle in and know where their run is, they don’t try too hard to get out but there can be the odd escapologist who seems determined to get somewhere she shouldn’t be! Hi, I had 7 chickens taken or killed on Wednesday afternoon, one of the hens was still warm when I found her and did not have a mark on her it was if she had died of fright, I found two more and then clumps of feathers. My hens run free and then go into two large huts with runs at night. I like them to be out and will put up the electric fencing but will the hens just jump over it as they always jump onto the stable door. Is there a fence with a roof which is movable or just the netting ones? Hens won’t usually get over the electric poultry netting because they too will receive a shock after touching it so they learn to stay away. If they are good at flying, the only other thing you can do is to clip one wing to unbalance them during flight so they can’t escape. Hi learning alot from here. 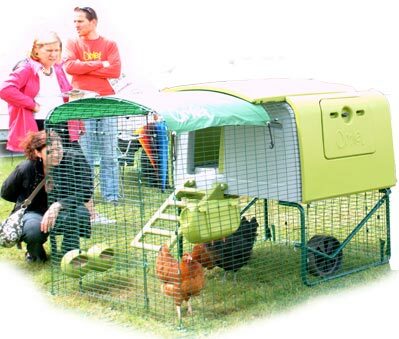 I’m wanting to get 2 or 3 hens. I have a young son. So need a friendly breed. Would I be right in thinking the Plymouth Rock and the Orpington breeds would be better for young children. And because there bigger birds unlikely to escape and a knee high fence would keep them off my young plants? Also I was wondering if they could be kepted on the patio so foxes can’t dig under. If I also have grit or soil tray for them to scratch in it and obviously let them have free range of the garden for a couple of hours aday when I’m outside? Yes, sounds good to me. I don’t know Plymouth Rocks very well but Orpingtons are certainly large and don’t tend to make it over a low fence. 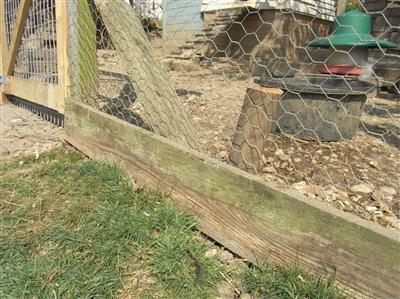 You can have a solid floor to your run – just remember to add boards around the base and 4-6 inches of wood chippings / rubber chippings or sand to allow the chickens to scratch for corn that can be scattered. 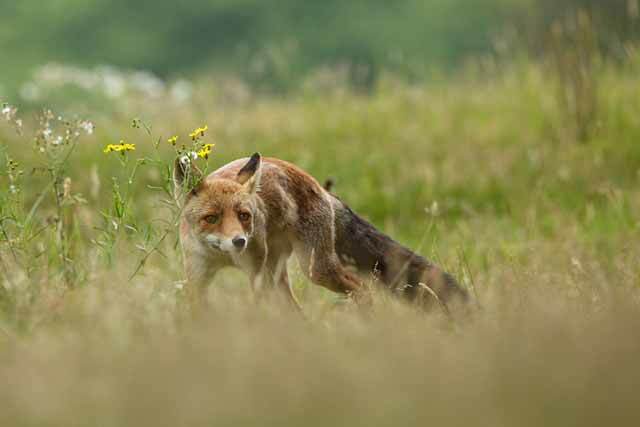 This allows them to have their most natural behaviour – foraging! Please advise me on what to do, I have 100 Cockrell caged in a 8ft *4 divided into two. Please I think I really need to extend the place,but don’t know the actual size to use because they are growing to about 5weeks now. Please also advice me on what to do because my compound is not that secure enough to give them free range.Is it quite necessary i give them light every night?. please what do I do I am very worried because I want to make it my real time business.Thanks. This is far too many birds in a small space in my opinion. I would have about 1/4 acre of fenced land, secured by an electric fence for this many birds at least. My problem is not with predators but keeping chickens in! My fencing is 6ft plus but one bird with clipped wings seems to have learnt to climb the fence. Any suggestions? I had thought of running an electric wire around the top or putting fruit netting up to partially cover the run but the total length would need to be about 50m. Ideas please? The trick is to clip just one wing to unbalance them but as for climbing chickens… I’ve not heard of this. I would guess there is a post or something she is using to walk up – a 45 degree corner prop for example is a favourite. Low housing is another – they fly onto the roof and then over the fence. You would have to watch and see what she does, it’s probably just one point in the run that needs modifying.